Galatea Resurrects 2017 (A Poetry Engagement): GARLIC HAY(NA)KU: "SHORT & STRONG"! Recently, I had the pleasure of judging the hay(na)ku poetry contest sponsored by Canada's Festival de l'Ail de Ste-Anne Garlic Festival. I thank Elizabeth Johnston, coordinator and creator of the garlic poetry contests, for the invitation to judge the contest which took place cheerfully on Facebook. The top winner, like other weekly poetry contest winners, will be displayed at the Festival on Aug. 26. From these "semi-finalists," a top winner is chosen by Festival goers -- a People's Choice type of award! I chose Sheila's poem for its clever layers involving synesthetic volta with a culinary metaphor. A monsoon is unlikely to reach the desert that is much of Arizona. But a rainstorm, and (as suggested) one that's a side-effect of a far-away monsoon, might touch this U.S. state -- it just “flavors” Arizona. In such case, that rainstorm might be as welcome as a mojo de Ajo -- or garlic gravy -- that improves (if not rescues) a dry side of beef. Of course, the steak need not be desert-like and mojo de Ajo still can elevate a perfectly-turned out dish, whether it's steak, chicken, shrimp, pasta or popcorn. Here are RECIPES! Sheila's poem also offers a synesthesia involving sight instead of taste. 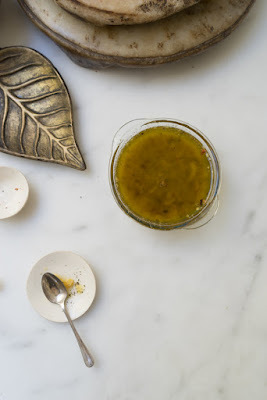 Look at the above photo of mojo de ajo from 101cookbooks and one can see in that glass bowl what a rain-splashed desert ground might look like! Lastly, Sheila's poem offers clever syntax as the "M/m"s and "A"s that begin the two thoughts -- "Monsoon / flavored Arizona" and "mojo de Ajo" -- offer both a consonance and visual rhyme as well as, given the switch from English to Spanish, a sense of translation. This hay(na)ku shows the grace and intelligence of Sheila Murphy's poetry. Congratulations, Sheila! As the hay(na)ku winner, Sheila also will receive a copy of BLINDFOLD by John Mikhail Asfour (McGill-Queen's University Press, 2011), donated by the Quebec Writers Federation and the Montreal Review of Books. Never has garlic been so lyrical as in this hay(na)ku. 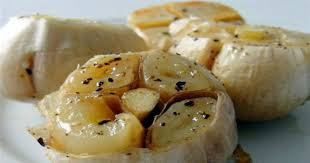 I love the hearkening of complicated personalities evoked by garlic which is that unexpected member of the lily family that does not receive consistent responses (one might hate as much as love garlic). And I adore its Hollywood ending of one finding/receiving recognition in a like-minded Other so that, together, they form a couple. I don't traffic much in the culinary arts so I had to resort to Google for the word "rocambole" -- in such exercise, I realized the brilliance of Elly's hay(na)ku. 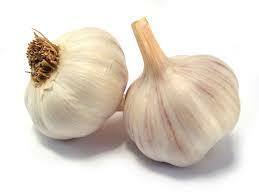 Rocambole is the most common type of garlic--I didn't know that; I just called garlic ... "garlic"! But why the reference to "problematic"? 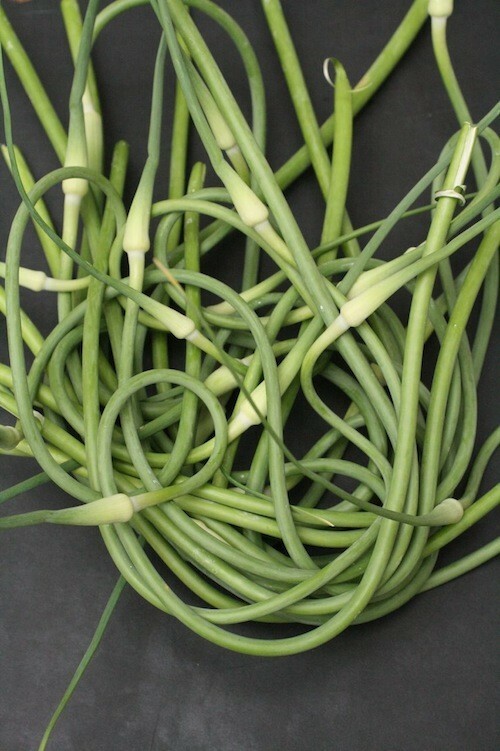 The answer lies in the third line's reference to scapes, flower stalks on hardneck garlic. Farmers harvest the scapes when they’re young so "they won’t drain nutrients from the garlic bulbs that will be dug up in a couple of months, plump and glorious and ready for drying.” Yet “problematic” is the poem’s turn or swerve for scales are also a pleasing “vegetable, aromatic, and even herb all in one.” Thus, the poem advises, "eat their scapes"! Click HERE for garlic scape recipes; another article HERE showcases what one can do with scales. Well-done by new hay(na)ku poet, Elly Nobbs! 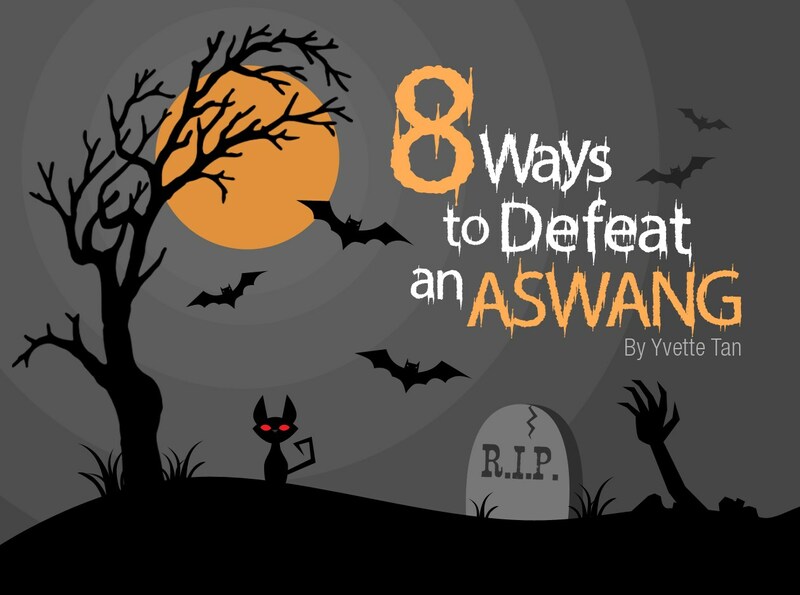 There's an actual list online of "8 Ways to Defeat an Aswang" by Yvette Tan. A nice swerve into a different type of pungency, Princess Fernandez! It seems fitting that I end with Audrey's hay(na)ku as it presents the on-point effect of garlic upon those with discriminating taste: hunger. More information about the hay(na)ku is available HERE. Love your celebration and exploration of the hay(na)ku, Eileen! Thanks for being the judge in our contest. My pleasure, Elizabeth. Thanks for organizing this!